I have a delectably sweet treat that you simply can’t resist! It screams Valentine’s Day!! I honestly couldn’t think of a more romantic treat than chocolate covered strawberries!! You would think something so romantic would be difficult or complex, but no, not these treats. 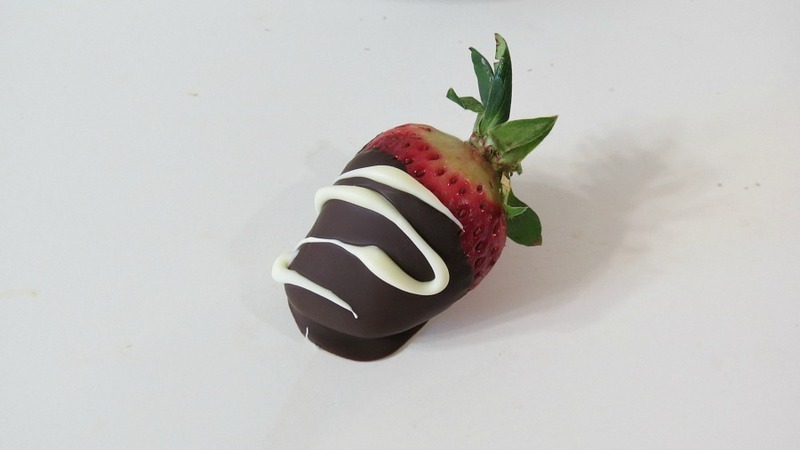 Who can resists a juicy, sweet strawberry dipped in dark chocolate and drizzled with white chocolate. I honestly forget how much I love them until I had one. 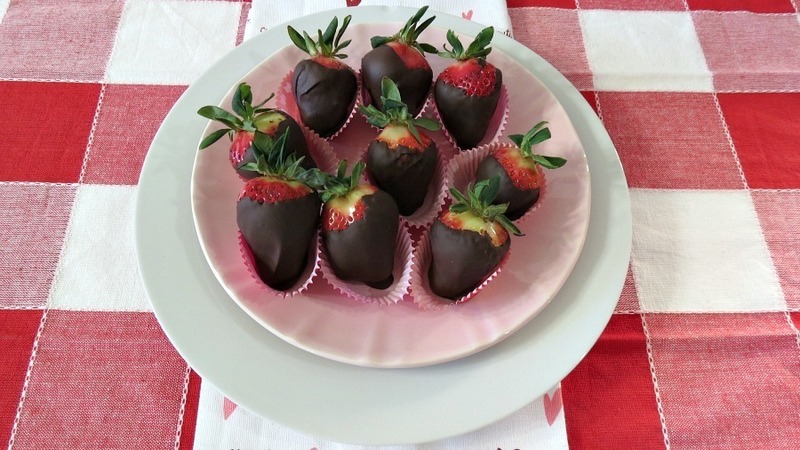 The key to making these fabulously delicious strawberries is making sure your strawberry is dry and you do NOT get any water in the chocolate. One single drop of water hits the chocolate, it’s all over! The chocolate will seize up and you have wasted all that wonderful chocolate. That would be a crime to waste chocolate! 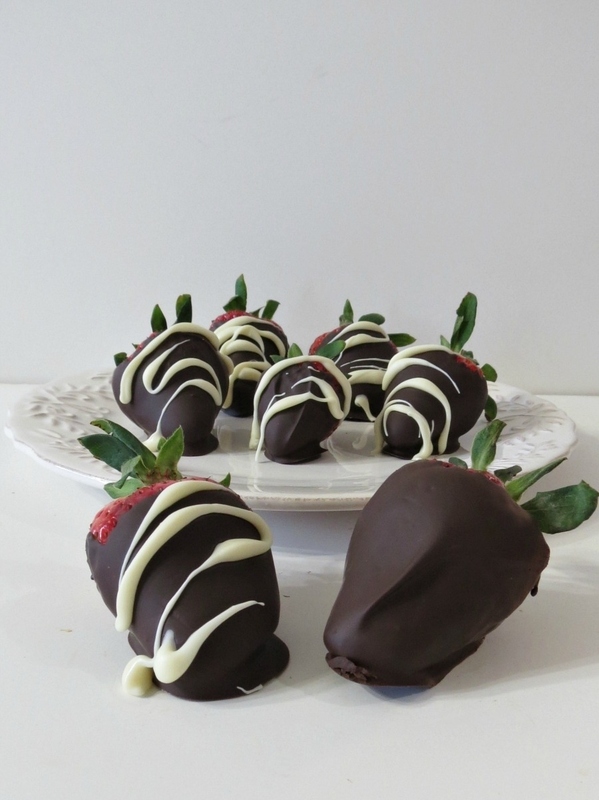 Another thing about chocolate covered strawberries is that once you have dipped your strawberries, refrigerate them for 15 minutes for the chocolate to harden. Don’t leave them in there too much longer or they will form condensation. Then your ready for the white chocolate drizzle if you prefer. Then refrigerate again for 15 minutes. These are really quick to make too! I made 20 chocolate dipped strawberries in about 10 minutes. For storing the chocolate covered strawberries, you can leave them loosely covered in a cool place in your home and serve within a few hours. Here are some directions that I got from eHow. Line the inside of a large resealable container with a paper towel. Dust the paper towel with baking soda. It will absorb excess moisture from inside the container and prevent the berries from becoming soggy without actually touching them. 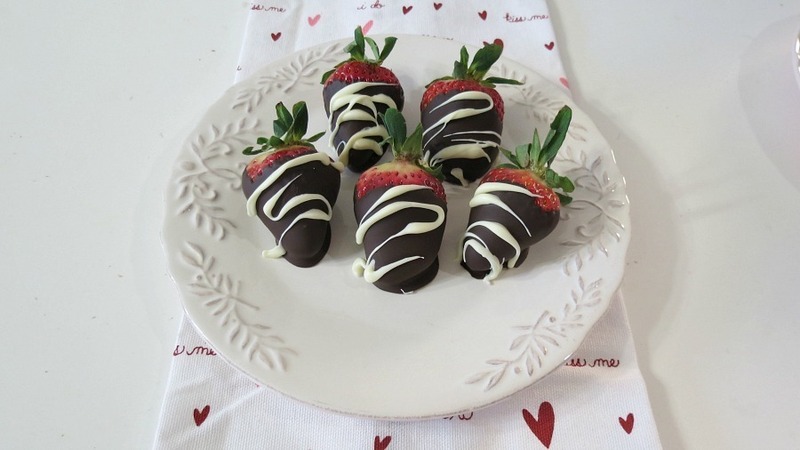 Place the chocolate-covered strawberries on a plate. Put the plate on top of the paper towel. Cover the container and place it in the refrigerator for up to one week. Freeze for longer storage. 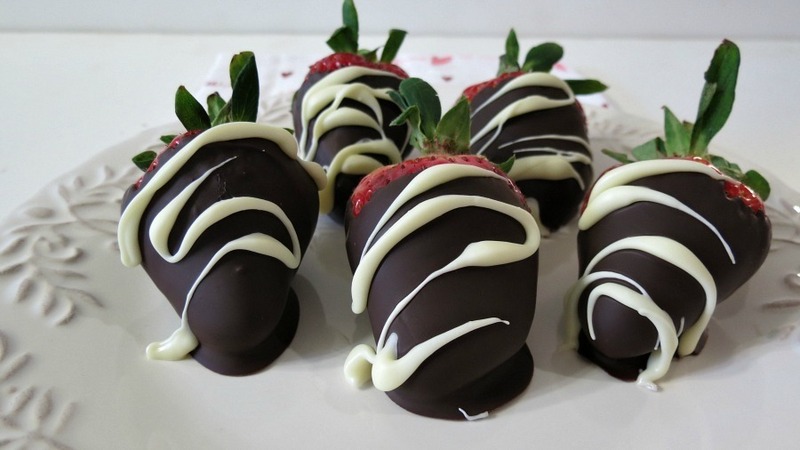 Sweet, juicy strawberries dipped in dark chocolate and drizzled in white chocolate. Wash and dry your strawberries thoroughly. Be sure they are completely dried and at room temperature. If any water touches the chocolate, it will seize the chocolate. Line a baking sheet or plate with parchment or wax paper; set a side. Create a double boiler if you do not have one; by filling a pot partially with water and placing a glass heat proof bowl over top the pot. I used a pyrex bowl. Just be sure the bowl does not touch the water. Place dark chocolate in bowl, and stir occasionally until melted. 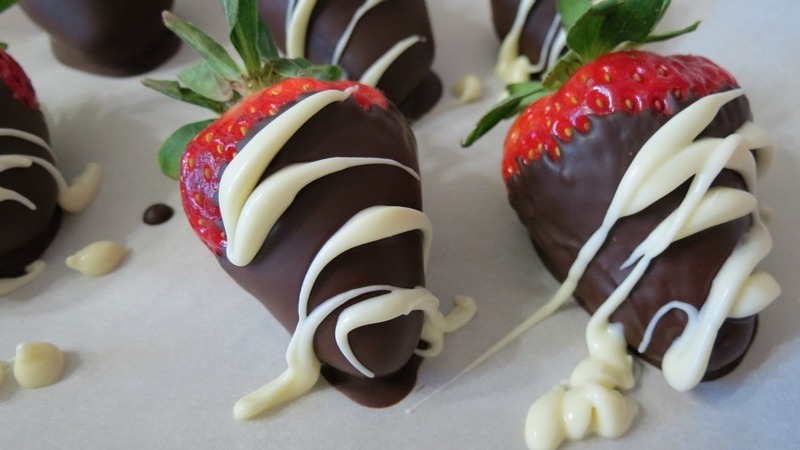 Grab the strawberries by the stem, and dip into the chocolate. Allow excess to chocolate to drip off, then turn the berry upside down for a few seconds to set. Place berries onto prepared parchment paper. 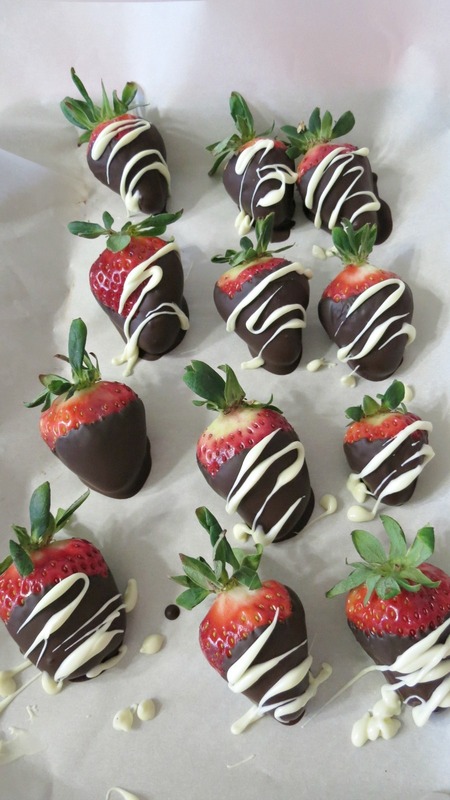 Once all of your strawberries are dipped, place in the refrigerator for 15 minutes, until chocolate hardens. Please note the calories maybe less than gave, I had some white and dark chocolate left over. One more thing I wanted to tell you, is that you should use a good chocolate. Personally I love Trader Joe’s Chocolate Pounder Bars. The chocolate melts so nicely. You could also melt the chocolate in the microwave, but to be honest, I’m not that good at that! I always over cook my chocolate. Nothing worse than burnt chocolate! I hope you enjoyed today’s treat! It was one that has been on my food bucket list since last Valentine’s Day! I am happy to share it with you today! To everyone else! Have a great day! Wow these look great! The perfect Valentine’s Day gift 🙂 I am going to make some for my hubby, he will love these! Chocolate-covered strawberries are one of those simple yet utterly perfect treats! yours look awesome! Ahh heaven-love these! I think they are the best treats ever created! One of my favorites!! And such a simple idea. We are doing this also for the Teacher Appreciation Day!! Gorgeous! Looks delish! Where and when did you take these pics? I hear they have printable backdrops for photos! I gotta look into them. I have been trying to shoot during the day for natural light. Gorgeous, Jen! You have the white chocolate drizzle down perfectly!!! PS…happy birthday to Little Jenny! Thank you for the tips! I make these all the time, but didn’t know about the baking soda tip. Happy Birthday!!! Oh my goodness!!! I want a few of these right now. They are soooooo beautiful and my mouth is watering! YUM! Thanks for linking up! Thanks Diana! They went quick in my house!!! Wish I had some more! I found you from Diana Rambles Party! I’m your newest follower via GFC. I host Fluster’s Creative Muster Party on Wednesday’s and would love it if you would come by and party with us. Hope to see you there!